NYC, 04/09/2019, 11:00AM. Two Time Grammy Nominated Trumpeter. 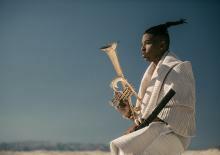 Trumpeter and composer Christian Scott is the nephew of famous jazz saxophonist Donald Harrison, His musical tutelage began under the direction of his uncle at the age of thirteen. Scott has won the Edison Award twice and has been Grammy nominated twice. Since 2002, he has released 12 studio albums, and two live recordings.